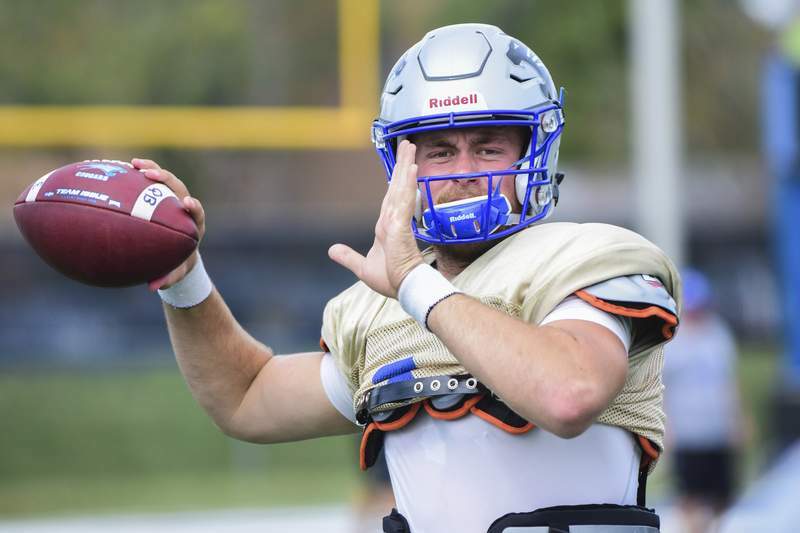 Mike Moore | The Journal Gazette Matt Crable took over this season as Saint Francis' starting quarterback after predecessor Nick Ferrer graduated. Mike Moore | The Journal Gazette USF starting quarterback Matt Crable during practice at Bishop D’Arcy Stadium on Thursday. He concluded his senior season at Saint Francis with a second NAIA consecutive title last year, but the Nick Ferrer Era is not exactly over for the Cougars. 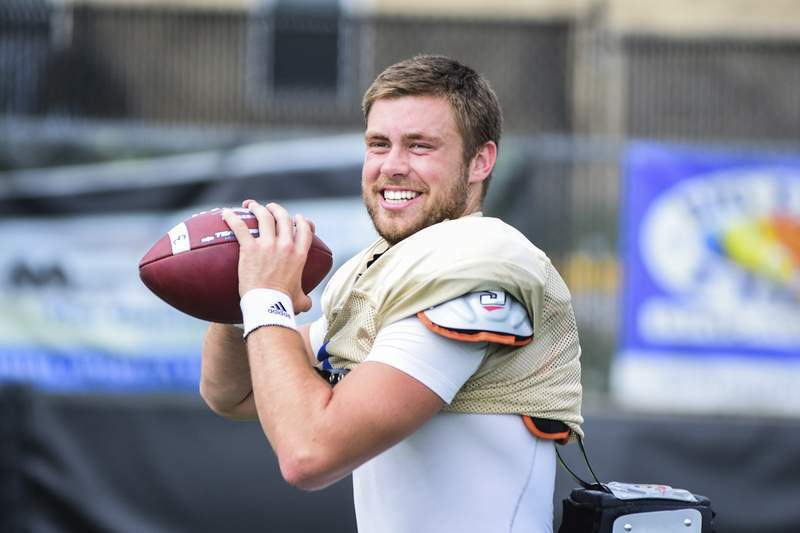 After being cut by the Detroit Lions this summer, the 2017 NAIA Player of the Year returned to Fort Wayne, where he works full time in the insurance industry and part time coaching quarterbacks such as Matt Crable, a sophomore transfer who has inherited Ferrer's old job. Ferrer still has designs on playing professional football at some level, and even if that doesn't pan out, he's ready move on to a post-playing career in insurance. He says Saint Francis coach Kevin Donley persuaded him to come back to his alma mater with the knowledge that it didn't need to be a permanent career move. “We have a great relationship, we enjoy each other's company, and we've been through a lot together,” Ferrer said of Donley. “It's good to share my knowledge of the program, of the offense and everything with the quarterbacks, especially with Matt being new here and being the starter now. Donley said Ferrer is a great mentor for Crable and the other quarterbacks, but the two are different in terms of style. “Nick is more of your typical pro-pocket passer. Stand tall in the pocket, deliver the football,” Donley said. “Matt is probably as comfortable or maybe more comfortable on the move, moving in the pocket. Ferrer said it might be easier for him to work with a player with a contrasting style than it would be to instruct someone more like himself. “He's crazy talented, he's super athletic, he's got a great arm,” Ferrer said of Crable. “What I'm good at is being in the pocket, going through progressions, all that stuff. He's more of a playmaker, he can scramble and make throws on the run, run the ball when he has to, all that stuff. Crable's first start played out nearly perfectly, as the Cougars beat Robert Morris 42-9 on Aug. 25. But the sophomore said he hopes to control the game better this Saturday, when the Cougars play at the University of St. Francis (Ill.) in Joliet. The Fighting Saints opened their season last Saturday with a 55-7 loss to Sacramento State University, an NCAA Division I school that plays in the Football Championship Subdivision. “I don't think you can take the score” at face value, Donley said, noting the wide difference between the levels of competition the two teams typical see. Donley specifically mentioned the Saints' linebacker play as a position of strength and said the host team will have a notable size advantage courtesy of its offensive line. “We know a lot more than we did about Robert Morris, because Robert Morris had a new (defensive coordinator) and we didn't really know what we were going to get,” Crable said. “Having at least one week of film really helps, just because we know at least what their base defense is and the gist of what they're going to do.